You can tell the holidays are right around the corner. The phones are ringing off the hook in the office, the fax machine is practically smoking and email boxes are bursting at the seams. I am more excited this year then ever before. Why, do you ask? Well, it’s the new Joy collection of yarns we have been shipping to our shops. I finally was able to get a ball of each and I whipped the scarves up in no time this weekend. 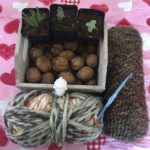 I wanted to share the yarns and patterns with you. Call your favorite local yarn shop TODAY because everyone is telling me it’s flying off the shelves. 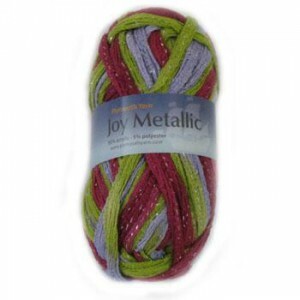 First we have Joy Metallic. 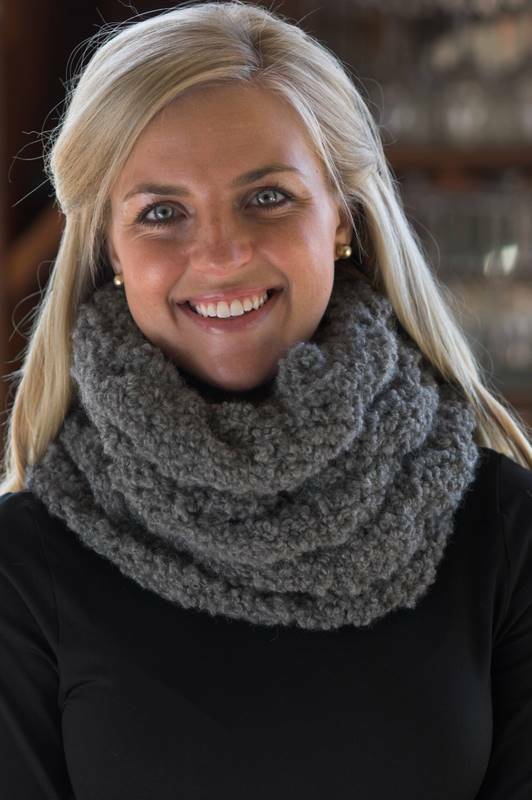 It’s a super quick knit full of ruffles and sparkly goodness. It’s perfect for New Year’s Eve out on the town or with a pair of blue jeans. Knitting Instructions: Spread open the mesh. Turn sideways so that the glitter effect is at the bottom. Cast on 8 sts across the top edge using a size US 10 needle. Knit through the top edge openings – one opening per stitch. Knit every row. 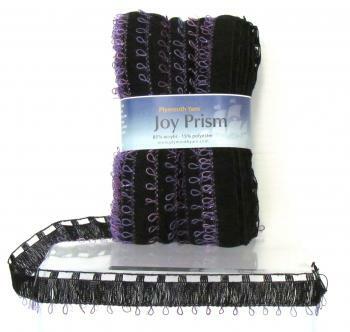 Next up we have Joy Prism with it’s sweet ruffles and delicate loops of sparkle. The color palette will go with everything in your wardrobe. Knitting Instructions: Spread open the mesh. Turn sideways so that the prism effect is at the bottom. Cast on 7 sts across the top edge using a size US 9 needle. 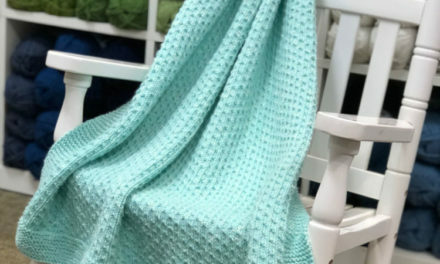 Knit through the top edge openings – one opening for the first stitch of every row, then skip a track hole each time for the other stitches of the row. Knit every row. 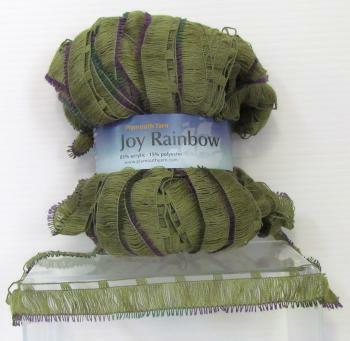 Last but not least, we have Joy Rainbow. Lots of beautiful ruffles in feminine color combinations without the sparkle. Knitting Instructions: Spread open the mesh. Turn sideways so that the rainbow effect is at the bottom. Cast on 6 sts across the top edge using a size US 10 needle. 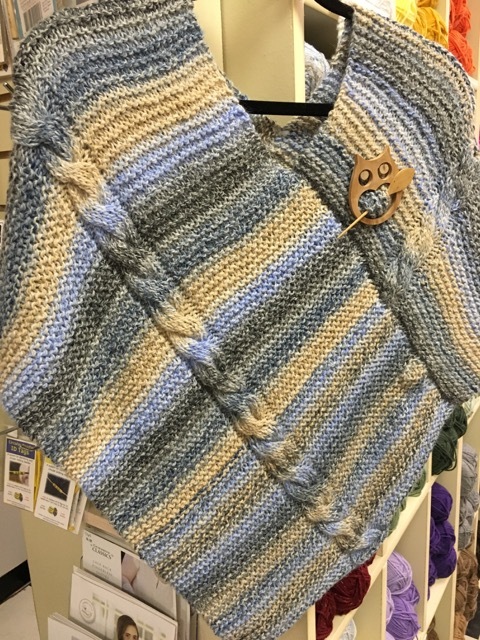 Knit through the top edge openings – one opening for the first stitch of every row, then skip a track hole each time for the other stitches of the row. Knit every row. 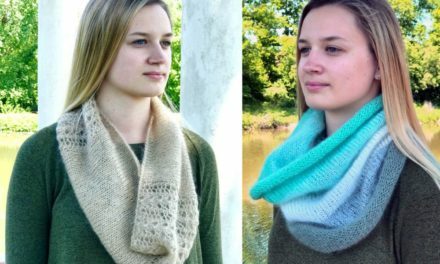 If you would like a little guidance on how to knit with ruffle yarn, you can check out Plymouth Yarn‘s YouTube page and view the “How to knit with Joie de Vie” video as the instructions are similar. Always knit through the top edge with the effect at the bottom. I hope you have as much fun as I am with our Joy collection of yarns, keep your eyes peeled for new additions to the line. Have you made scarf already with one of these yarns? Come visit our facebook page, post a picture and tell us all about it.